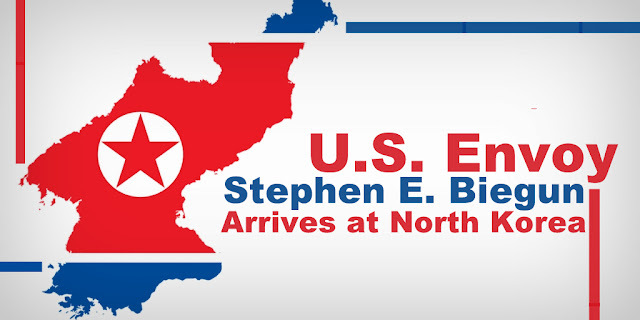 On February 6, 2019, the United States Special Representative for North Korea Stephen E. Biegun has arrived in Pyong Yang just as US President Donald Trump confirmed during his State of the Union address that he would meet North Korea's Chairman Kim Jong-un in Vietnam on February 27 and 28. This is the second visit of Biegun to the North Korean capital, following a trip last October in which he met with Kim Jong-un. According to the State Department press release, Biegun is going to meet North Korean counterpart Kim Hyok Chol to prepare for the President Trump’s second summit with Kim Jong-un and advance further progress on the commitments made in Singapore - "complete denuclearization, transforming U.S.-North Korea relations, and building a lasting peace on the Korean Peninsula". According to a statement released by South Korea’s Foreign Ministry, Biegun arrived in Seoul and met his South Korean counterpart Special Representative for Korean Peninsula Peace and Security Affairs Lee Do-hoon on February 3 and discussed upcoming U.S.-North Korea summit. Biegun also met with South Korea’s national security adviser, Chung Eui-yong, on February 4. Prior to traveling to the Korean Peninsula, in a speech at Stanford University on January 31, Biegun said the Korean War is over and done. "President Trump is ready to end this war. It is over. It is done. We're not going to invade North Korea. We are not seeking to topple the regime. We need to advance our diplomacy alongside our plans for denuclearization in a manner that sends that message clearly to North Korea as well. We are ready for a different future." He further added, "President Trump has made clear, both to North Korea, as well as to our team that he expects significant and verifiable progress on denuclearization -- actions that are bold, and real to emerge from that next summit." Korean watchers are optimistic like Prof. John Delury who is an associate professor at Yonsei University Graduate School of International Studies in Seoul. According to Delury, Biegun is pushing a radical shift in U.S. policy toward North Korea — "with a level of detail and thoughtfulness that is revelatory."